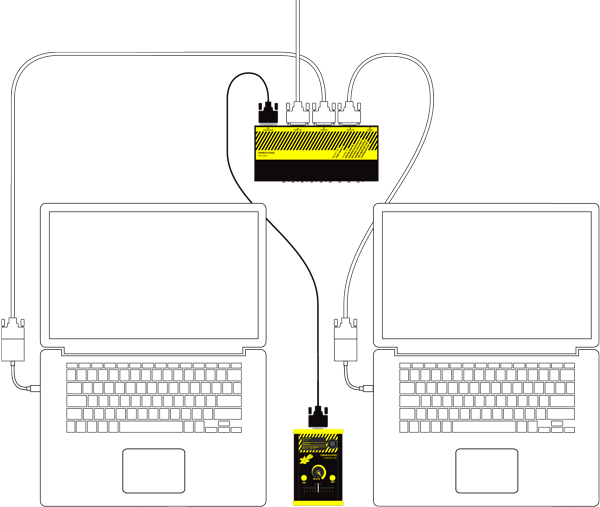 The *spark d-fuser lets you crossfade between laptops. Whether switching between presenters or pushing avant-garde pixels, hands-on control for mixing DVI, VGA and HDMI signals is now available in a compact and affordable package. It's best seen in action, so watch this video to get the tour. A crossfader between left and right. If it sounds a simple premise, thats exactly the point: obvious, immediate. 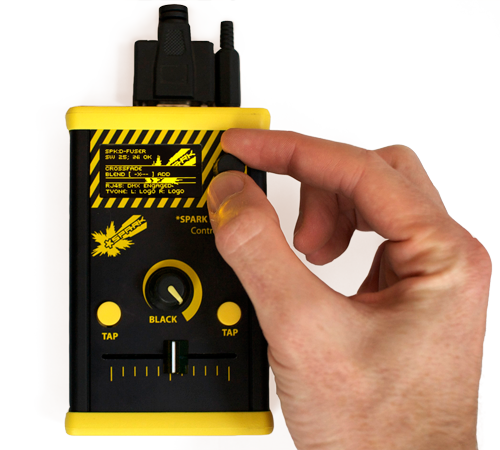 Source to the left, source to the right, the *spark d-fuser gives you the hands-on controls to set what – if anything – goes through to the screen. To be useful, it has to be simple and quick to get going. The artist collective D-Fuse have been pitching up at theatres with development *spark d-fusers since 2009, and the lessons learnt have been rolled in along the way. Keep the screen running nicely regardless of whats happening with your sources. If your laptop goes to sleep, the screen won't. If a cable is yanked, the glitch won't make it through. Displays now come in all shapes and sizes, the same goes for all the leads and formats that flow through them. The *spark d-fuser is up to the challenge: DVI, VGA, HDMI, and loaded with resolutions beyond broadcast standards. Crossfades can be artful compositing. Unique to the *spark d-fuser, the crossfade behaviour can be tweaked to fade with a flat blend or right up to a full additive mix. Want to pull a key? It can do that too, chromakey of left over right. Hands-on control is not the whole story. There is an extra socket that allows the *spark d-fuser to communicate with other equipment you have on stage or as part of the venue. It can be slaved to the lighting desk through DMX, or inform the audio mixing what the video mix is doing. To make the *spark d-fuser, we take an award winning video processor, partner it with a custom controller designed to give you the hands on control and worry free setup you need, and work both these over with custom firmware. The controller sits up where your sources are, allowing you to push the processor and video cables away from your working area. Wiring is simple – see the adjacent diagram. The video out can go direct to a single screen, or using devices such as the Matrox TripleHead2Go Digital Edition, you can drive multiple displays as if they were one. A hardware controller developed by *spark live. At one end, the hands-on controls, easily operated by one hand with your attention elsewhere. At the other, the display, menu control and connectors. Mix mode – Set to crossfade mode, with ability to tweak Blend–Additive fade curve. Set to a key mode, choosing from an arbitrary number of keying colour presets, with ability to tweak/reset the colour parameters. Resolution – Set output from a curated list of resolutions, which will also set the corresponding resolution options advertised to the sources. This curated subset can be easily changed via editing a text file on the internal USB drive. Network – Set to send/receive the crossfade and fade to black positions over either OSC; ArtNet; DMX in or DMX out. Troubleshooting – A negotiation happens whenever DVI/HDMI devices connect. The *spark d-fuser has gig-tested strategies for this, handling the details of HDCP and EDID so you don't have to. If there is a problem, this menu has problem-orientated fixes to try. The network communication uses an RJ45 socket, with a hardware toggle to switch it's mode between Ethernet and the RS485 of DMX. Network cables will plug straight in, for DMX equipment using XLR 3 or 5 pin connectors adapter cables can be easily made up or purchased online. A TV One 1T-C2-750 upgraded to d-fuse specification: configured to partner the controller, extra resolutions pre-set, and upgraded with custom firmware providing additive mixing. The video sockets on the processor are single-link DVI-I (Integrated), meaning that DVI-D cabling and VGA cabling (via DVI-A to VGA adapters) can be used interchangeably. The processor's output drives VGA and DVI simultaneously, to take advantage of this use a 'DVI-I Male to DVI-D Female + VGA Female' splitter cable. The 750 is also fully compatible with HDMI sources and outputs: use DVI-D to HDMI cabling and choose an appropriate resolution from the controller's menu. As supplied, the curated list of resolutions selectable from the controller is as follows. This is a subset of the processor's available formats, with coverage for over 100 more permutations of resolution, refresh and other parameters. For full details of the processor's capability see the TVOne 1T-C2-750 spec sheet; advanced users can full take advantage of the 750's deep customisability. The *spark d-fuser is sold out. The first production run was crowd-funded in 2012, and units were sold on-line for three years thereafter. Quite the journey. Thanks in particular to Bob Carter of Outsource Electronics for manufacturing and logistics. Recommended. The video processor used by the *spark d-fuser can still be purchased: the 1T-C2-750, available from TV-One stockists worldwide.